Much as I have loved my book launch events this fall, some of the most deeply satisfying moments occurred while I was sitting in front of my computer reading an email, an Amazon review, or a Facebook message from a reader who found the book moving or helpful or powerful or all-of-the-above. There’s nothing quite like knowing that I reached someone out in the world, whom I haven’t met, and touched them with my story. Unlike my bookstore appearances, in this circumstance I am not selling the memoir by sharing well-chosen excerpts from it, or fielding questions from readers who might buy my book. In this case, I don’t have to do a thing, except receive my readers’ responses in the spirit in which they are given: generously, humbly, enthusiastically. In these encounters, there is nothing between us, except the work itself. It’s the bridge and conduit to a pure author-reader connection. After years of solitary writing and re-writing, I’m enormously gratified to know that readers have embraced Dying in Dubai. 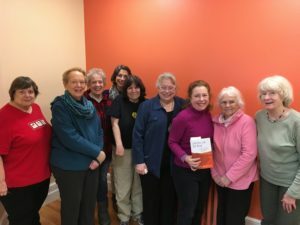 This is not to say that my live experiences with book groups have been in any way lesser. Not at all. They’re just different. Whether via Face Time—I chatted with a Cape Cod group this way; they passed the phone around their circle and tackled every one of my website’s Reader’s Guide questions—or in person at my hometown public library’s book group, the gatherings are fun, intimate and informative. The fact that some or all of the group members know me (or think they do) colors their responses and sometimes skews the discussion towards the personal as opposed to the literary. All good. Readers who know me either don’t want to go near the delicate aspects of my story—understandably, relatives didn’t want to talk about the infidelity thread*—or they want to go directly at it. I opened the door, and they walked through it, or walked around it! The most surprising reaction has been that of my two closest friends, both of whom have known me for decades. Both have struggled with absorbing my experience in book form, perhaps because they were part of it; it seems to be as emotional for them to read as it was for me to write. I realize that they are also dealing with revelations in the memoir that I didn’t share with them, close as we were. This was a conscious choice on my part. I wanted everything that had happened to me to exist nakedly on the page and didn’t want to risk diluting the impact by the kind of processing girlfriends do. This slowed them down considerably. One still hasn’t finished reading…. In contrast, I’ve heard from many readers that “it was a page-turner,” “couldn’t put it down,” “wanted to finish it more than I wanted to eat supper.” (That one made me laugh!) There are widows who loved it, and married women, for whom my story is their worst nightmare, who were glad to read the upbeat ending. A number of readers said that they felt like they “knew my husband,” and recognized the deep connection between us. I was happy to know that I got my major point about the marriage across. Many who spoke to me remarked how much they loved Wali’s “big as the universe” metaphor for the grieving process, and some said that they passed it along to friends going through loss. Glad to hear it. As 2016 winds down, I welcome more comments from anyone who reads my book. I’m keeping a book of reader responses, which I will treasure long into the future. I welcome yours, and look forward to the events and book group discussions I have scheduled for 2017. Bring it on! Happy Reading and Happy New Year to all!